Grab some friends and go on a wine adventure of local wineries at downtown Kirkland businesses. 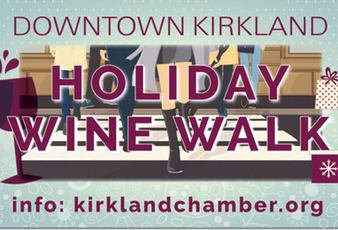 Meet the winemakers from 14 wineries and 2 breweries and sip, shop, stroll, and sip some more thru scenic Downtown Kirkland, a vibrant waterfront destination all decorated for the holidays! Located on the shores of Lake Washington just east of Seattle. Produced by Seattle Uncorked and WBS Events in collaboration with the Kirkland Downtown Association and Kirkland Chamber of Commerce.